Thank you for shopping with us. We're glad you're here. As a company, we are at your service. Free free to reach out to us with any request. We try to make it simple to contact us. Call us during our normal business and speak with a live customer service agent. Prefer email? Our RESOLVE Customer Support system is ticket-based so every customer service request is tracked and completed with resolution. If you have any questions, please let us know. We look forward to hearing from you. 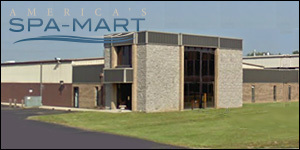 The 25,000 square feet headquarters and main distribution center of America's SPA-MART in Cincinnati, Ohio. You can check the status of your order online by logging into your account and then clicking on Order History. Your store login information is separate from your eSupport login information. Sometimes your order confirmation gets trapped by your spam filter. Whitelisting our domain spa-mart.com will help in receiving communication from us. We do not operate a retail storefront. The address above is only a distribution and manufacturing facility. Filter cartridge brands are interchangeable, for the most part. Specifications are not. Double-check your size and/or reference number before ordering. Custom-made products, such as spa covers, cannot be returned. Please double- and triple-check your measurements. Current coupon codes are typically posted on our weblog at blog.spa-mart.com. Read our Sales Terms and Conditions prior to ordering. Our RESOLVE Customer Support Portal is more than just a place to send us an message. There you will find a robust knowledgebase that includes a large variety of articles and document downloads. Click on the RESOLVE logo below to enter the portal.